She knew he was right. It was time to come clean. “Start with your name,” he said. Left with emotional scars from his time in an orphanage, Rand Sinclair has vowed never to marry. But when he discovers Callie Quinn and a small orphan boy hiding on his ranch, he can’t help but open his home to the desperate runaways. Callie has been betrayed by every man she’s ever known. While she’s grateful for Rand’s incredible kindness, she knows it’s only a matter of time before he shows his true colors. But she needs this safe haven—maybe the outlaw on her trail won’t find them here. Yet as Rand slowly uncovers her secret fears, they each come to realize that the only way to keep her safe is for Rand to risk everything to offer her the protection of his name…and his heart. Howdy, ma’am. 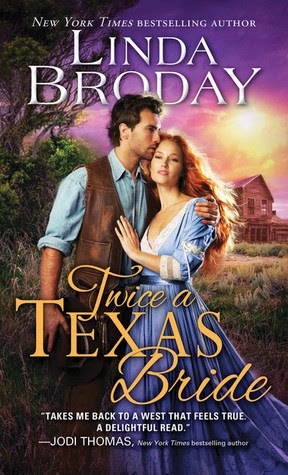 I’m Rand Sinclair the middle brother in the Bachelors of Battle Creek series – Twice a Texas Bride. Well, my main one is staying alive. That’s pretty important, especially since the outlaw Nate Fleming is trying to kill me. But playing poker is what I do for fun. I became quite adept when I owned the Lily of the West saloon. I sold that, of course, so I could buy the ranch I’d always dreamed of owning. There’s lots of fun in winning the pot in the center of the table. Takes skill and nerve. Amber since it’s the color of my lady’s warm beautiful eyes. When Callie Quinn turns them on me, my heart gets all excited and starts racing like I’m in the middle of a herd of stampeding buffalo. Lord, they’re beautiful and so is she! Becoming a father to little Toby and baby Wren. I never thought I’d be a father and had closed off my heart to the possibility, but these two adopted children is the greatest thing in the world. Toby needed someone to look up to. Lord knows, the six-year-old didn’t have much of that with the outlaw Nate Fleming. And Wren being left orphaned and all needed someone to love her. Both of them have me and Callie now. “To keep?” Toby’s eyes widened and his big grin spread. “Let’s move it over by the woodpile, where it’s out of the way.” He was going to be the only white man with an Indian tepee on his ranch. How had this sorry state of affairs come to pass? But he wouldn’t say no. It meant too much to Brett and to Toby. “This could be very magical to a child,” Rand said gently. Biscuit gave a loud whine and spun around in a circle as though she too was adding her two cents’ worth. When she lifted her eyes to Rand, he gave her a lopsided grin and a wink. Getting tangled up in her warm whiskey gaze could be quite pleasurable, he found. Rand stood watching the pint-sized squirt relay what little facts he knew. He already loved this little kid. Whatever had happened to them, it made him happy that he could help bring a light to the boy’s eyes. He remembered how dull they’d been when he’d first found them in the run-down bunkhouse last week. His mind turned back time to the days following his, Cooper’s, and Brett’s escape from the orphan train. To avoid detection, they’d slept during the day and traveled by the light of the moon, eating food whenever they found some or managed to kill a rabbit or squirrel. Cooper was always the one to watch over them and fight when things called for it. He’d once tried to kill Tolbert Early in a bathhouse for attacking Brett. Toby had that same protective instinct. Rand only prayed he could help the boy stay a boy a while longer. Once you became a man, you could never go back. “Where are you, brother?” Brett asked. With Biscuit supervising and pretty much getting in the way, they all pitched in erecting the tepee, which was made from buffalo hide. Working side by side with Callie proved the best part. Each time their hands touched, a current ran up Rand’s arm. He couldn’t imagine what might happen if the touching involved a bed and the scent of night around them. He’d probably just explode faster than a load of nitroglycerin. Likely find pieces of him three states over. The haunted look had begun to fade from her eyes a little, and she wasn’t as tense and anxious as when they first arrived. Maybe, just maybe, the fear would be gone soon. And then he intended to kiss the daylights out of her. Of course he’d go slow. He closed his eyes and watched it play out in his head. He’d start by kissing each eyelid, then move to her shell-like ears and trail kisses down her long slender throat. Tiny nibbles at the corners of her mouth. Trace the seam with his tongue. Only then would he press his lips fully against hers and take all that she wanted to give. “Just show me what to do,” Rand snapped. As they worked, Rand’s gaze kept straying to Callie’s soft, round curves. The woman was going to be the death of him yet. Even so, he was realizing he’d die a happy man if he could only get a taste of her lips. Linda Broday now resides in the panhandle of Texas on the Llano Estacado. At a young age, she discovered a love for storytelling, history, and anything pertaining to the Old West. Cowboys fascinate her. There’s something about Stetsons, boots, and tall rugged cowboys that get her fired up! A New York Times and USA Today bestselling author, Linda has won many awards, including the prestigious National Readers’ Choice Award and the Texas Gold Award. She blogs regularly at www.PetticoatsandPistols.com. This post may contain affiliate links. To learn more please click here.